He looks up at us from a neo-natal position, coiled on a sagging wood floor. He is wary, almost cowering as he observes us staring back at him. Behind rises a chaotic landscape of architectural debris, a battered airplane, and industrial windows. They frame a basilica of wreckage, beyond only a distant building and a hint of undergrowth. A sparrow finds its way above the ruins. It is an alternate Lewis Carroll world: "We are all mad here," but it is another place and it is another man. Alice Leora Briggs notes that "All of my work is about Juárez." She fixes on her experiences and spends much time in northern Mexico, just across the bridge from El Paso. She travels as often as possible to an asylum built by a visionary and sited on the desert fringe of Juárez. She helps, she talks, she looks, she takes pictures, she brings tools and supplies, she works with the residents on art projects. They share meals together. She smells the place, touches the restraining bars, befriends the dogs, and listens. She is drawn to the people here and drifts to this place again and again. It resembles both heaven and hell. 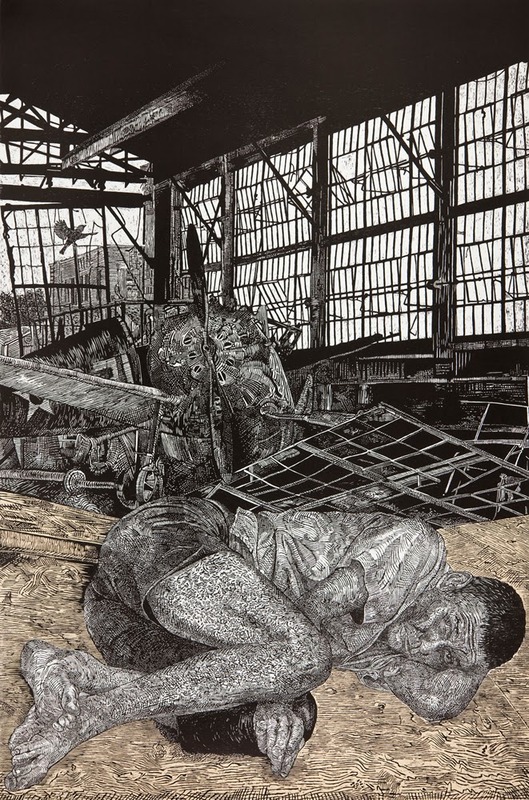 This monumental woodcut print, La Ventana, is one of many images that Alice has conjured from the asylum in Juárez. Printed as an edition of ten, it is available at Flatbed Press and Gallery. Alice's large woodcut is the largest chine collé relief project (61 1/2 x 41 1/2 inches) created at Flatbed Press. Her carving of the wood panel at this scale yielded a richness of minute details articulated over the entire surface. The chine collé refers to the natural buff color in the print that was created with pieces of a Japan paper called Kitikata collaged onto the print while being printed. La Ventana, translated from the Spanish as "the window", may be the closest some of us will get to this borderland. Just like the border between the U.S. and Mexico, we see through a glass lens and perceive a barrier. Maybe it is a mirror.